All of my boys' names begin with the letter "B". We didn't do that intentionally, but that's just how it ended up. Sooooo, when it comes to decorating a room for the three of them, it only made sense that I should incorporate the letter "B" into the room somehow. And how, you may ask, did I decide to do that? Why, with a wall collage!! 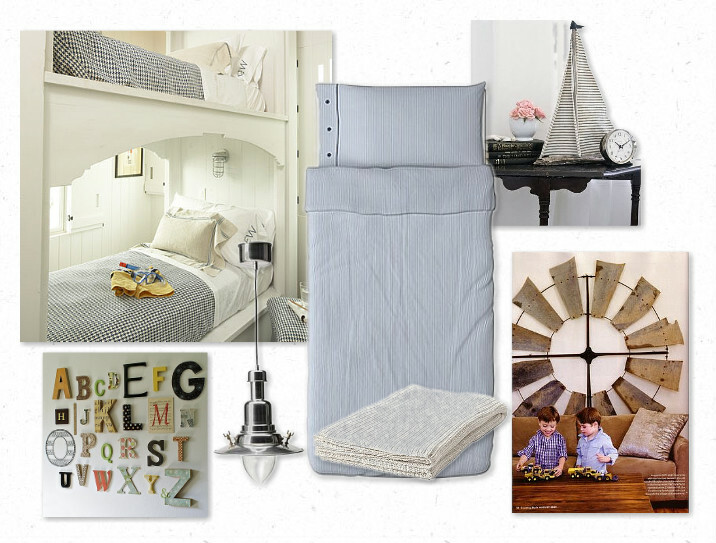 You may recall that my original inspiration board for the boys' room included an alphabet collage. 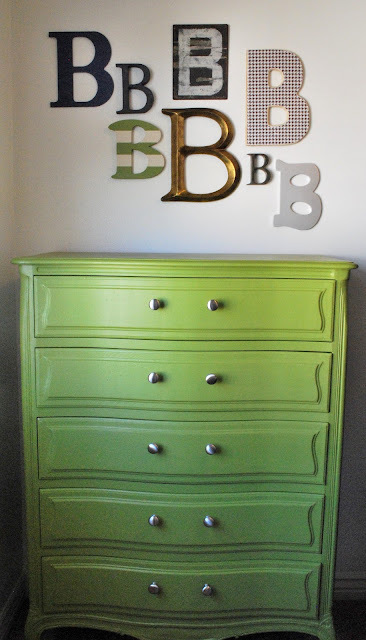 So I set about collecting "B"s. And you may recall a little tutorial I did on how to create your own Mod Podge letter. In any case, after a bit of searching, painting, and Mod Podge-ing (yes, that is a technical term)... I give you The B Wall. So the boys' room is almost complete. Just have to finish the window treatment and make some basket liners (a la Restoration Hardware Kids), and then when the final piece de resistance arrives in the mail, I'll put it on the wall, and we'll be ready for the big reveal! I can't wait!! Wendy, I'm loving your B's!!!! Fantastic!!!! Can't wait to see the whole room! Love the B wall! I'm sure the reveal is going to be fantastic! Wendy! That's a terrific idea. 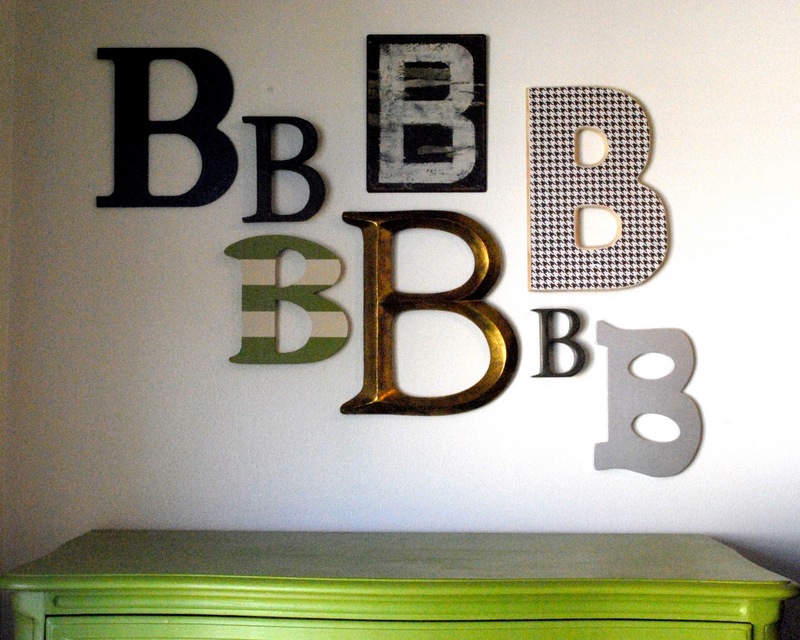 I like the collage of "B's" even more than the whole alphabet for sure. Very cute. I kinda want to make some for my bedroom . . . I'm not too old for that, eh? That is a great collection of Bs! So cute. Looks Great! And I love the color of the dresser! This way they all get to say 'that's my B up there'. Like your twist on the alphabet wall and your 'organic' flow to it. What a great idea! I love all the colours and textures, and the colour of that dresser is fantastic! Absolutely love the green colour of the dresser... and well blue is always a top colour for me. Looks so fresh and clean. ALL my boyz start with A...I'm totally going to do this! Thanks for the great idea!